Spc. James Strong, holding daughter Carrie, and wife Suzette talked yesterday about the impending deployment of about 7,000 Schofield Barracks soldiers to Iraq. Army Spc. James Strong joined the U.S. military last year to pay back the country that had just granted him citizenship. Spc. Jeff Chitwood rejoined the Army in December because he felt he was not doing enough for his country in the National Guard. Strong and Chitwood are among about 7,000 Schofield Barracks soldiers heading to Iraq over the next five weeks for a one-year deployment. It will be the 25th Infantry Division's largest single deployment to the Middle East. In 2004 about 9,000 soldiers went to Iraq and Afghanistan in separate deployments. They returned just last year. 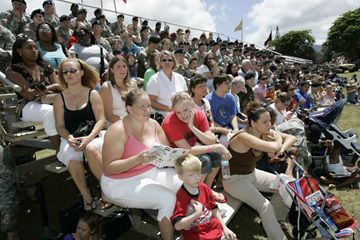 The Army held a deployment ceremony at Schofield's Sills Field yesterday for the 7,000 soldiers. Gov. Linda Lingle told the soldiers that the people of Hawaii will look after their families. "They are part of our state's ohana, our family," she said. Strong and Chitwood will leave behind wives and small children in military quarters here. Family and friends attended yesterday's deployment ceremony at Schofield Barracks for 25th Infantry Division troops leaving for Iraq in coming weeks. Suzette Strong, 38, had hoped for a little more time to get used to being a military family member than the one month she has been in Hawaii -- she had been away from her husband while he underwent training -- especially since she will be raising daughters Carrie, 4, and Tia, 2, by herself. But she is making friends and supports her husband's decision to join the Army. "It was based on his conviction that he was thankful for his freedom," she said. Until the end of 2004, James Strong, 34, was a British citizen even though he had lived in California since he was 5. After he graduated from college, he worked as a forester drawing up timber harvesting plans for companies in Northern California. He said it was a growing sense of obligation that persuaded him to sign up even if it meant giving up a job he enjoyed and a higher salary. "I'd see bumper stickers supporting the war. And I kind of felt, 'How can I put one of those bumper stickers on my car when I'm still young enough to serve?'" he said. After the ceremony, Capt. Derek Schmeck, top right, picked up daughter Sienna, watched by his wife, Amy. Strong is a counterintelligence agent assigned to B Company, 3rd Brigade Special Troops Battalion. Chitwood is an infantryman assigned to Headquarters Company, 2/27 Infantry Battalion, as the driver for the command sergeant major. After he completed a three-year enlistment in 1989, he operated his own concrete business in Southern Illinois. After Sept. 11, 2001, he felt a need to help the country, and in 2003 he joined the National Guard. "It just wasn't what I was looking for," he said. 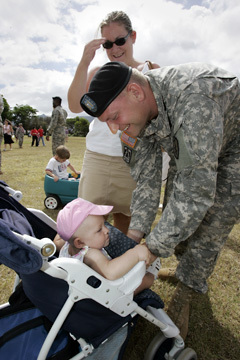 His wife Lacy, 28, agreed with his decision to volunteer for active duty. "At the time it just seemed he just wasn't doing enough," said Lacy Chitwood. 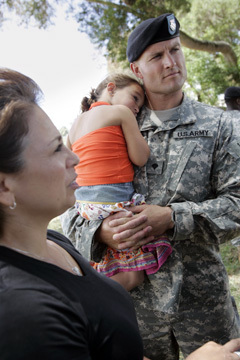 She will be raising sons Tyler, 10, and Brody, 3, and daughter Chloe, 5, while her husband is in Iraq. All Schofield soldiers headed for Iraq are scheduled to be in that country by Aug. 15. In Iraq they will join troops from Fort Bragg, N.C., and Fort Hood, Texas; a Stryker Brigade from Fort Lewis, Wash.; and five Iraqi divisions in northern Iraq to form the Multinational Division-North, an area seven times larger than the Hawaiian island chain.